When You Want To Do a Detox, But You Know They Are Unhealthy! 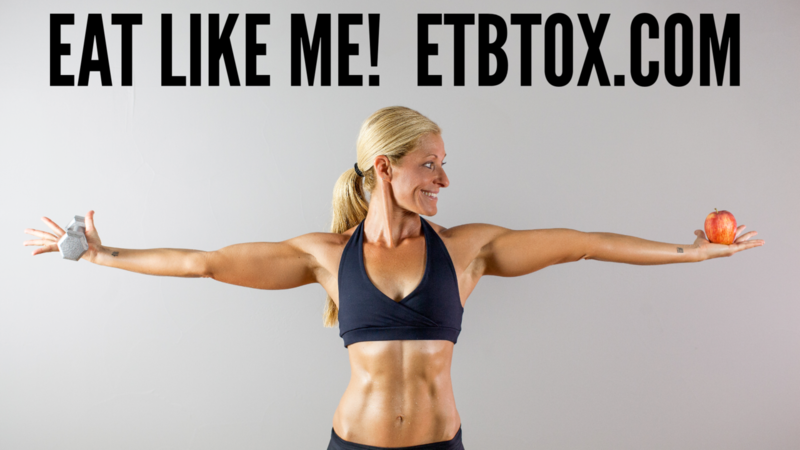 This 4-week program is NOT a De-Tox, but rather the ETB-TOX done on your own! Most start dates are the first Monday of the month! I don’t believe in depleting the body of necessary fuel/calories and taking in UN-necessary supplements/shakes like most detox programs! That simply slows down your metabolism, makes you cranky and gives you a shelf full of products you just don’t need! I believe that when you have not been honoring your body with clean food & exercise, you simply need to be guided back on track in a healthy way! That is why I created the ETB-TOX! It is the Earn That Body program to recharge your health and life! The ETB-TOX Work Book of Accountability (PDF) to track your weight, Steps To ETB-TOX, Work Outs, Goal Setting and more. The STEPS To ETB-TOX: To guide you in making changes to food quality & quantity. The program is structured to give you day-by-day steps for cleaning up your nutritional intake. This approach is less overwhelming since you only have to make a few changes at time! Guidance on how many workouts you need per week! New healthy recipe favorites that I personally make and eat! Food/Drinks that are/aren’t “Eagle-Ized” (that is …foods that I consider LEGAL or NOT LEGAL on the program). There is NO Facebook Group for ETB-TOX-ON-MY-OWN. This program is designed for YOU to do ON YOUR OWN. This is a GREAT program to clean up your nutrition & get you working out consistently.